In 2004, 10-year-old Ellie Ambrose heard a missionary speak to her church. That Sunday morning encounter would change her life and the lives of thousands of kids in Africa. At the time the missionary shared stories and photos of children in the Kibera slum who had one set of clothes, torn shoes and no promise of three meals a day. Their ability to even go to school depended on their ability to scrape together $25 a year for shoes, a uniform and schoolbooks. Shocked at their situation, Ellie did what most adults don’t do after a missionary speaks to a large church service in a religiously-oriented community. She dreamed. And she took action on behalf of students she had never met. Over the course of the next several weeks, Ellie prayed that God would help her find a way to give these orphans some of the same things she had in America – shelter, food, clothes and a chance to go to school. The result of her prayers was a conviction to start a 5K race that included a carnival so that runners and families would be excited to attend. 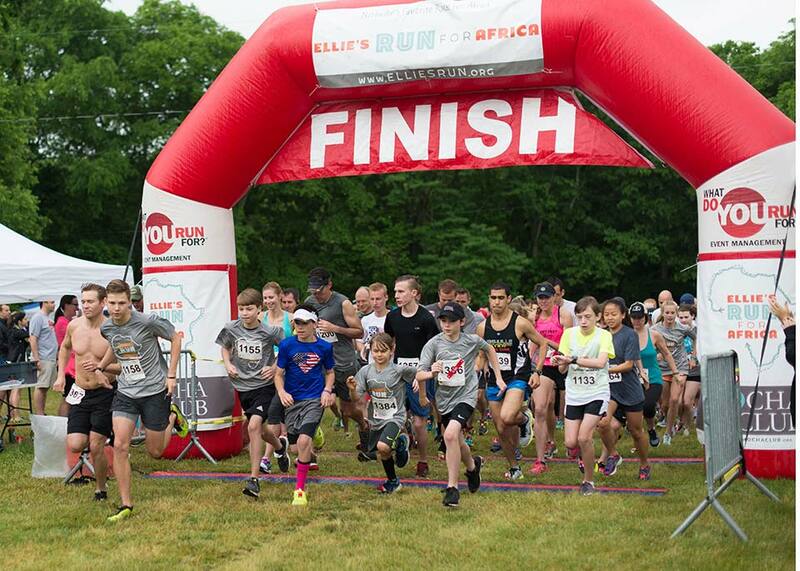 At the age of ten, Ellie recruited a team of volunteers to help her host the first Ellie’s Run for Africa. Drawing approximately 700 attendees, that first event featured a 5K race, inflatable games, food and cultural entertainment for all who attended. In the end, it raised more than $18,000 for schools in Kibera – one of Africa’s largest slums. That year, Ellie made her first trip to Africa to visit the students in Kibera she had only seen in pictures. Her time there was spent not only meeting the physical needs of hundred of children, but also connecting – kid-to-kid – with the children. Since that year, Ellie has now racked up four trips to Africa to continue to see how the funds raised through the race impact the kids she has grown to love. In 12 years of running, ERFA has raised over $650,000 for kids and students at the New Dawn Educational Center in the Huruma slum of Nairobi, Kenya. For those in Nashville, it has often been the first competitive race for many people and it has given the middle Tennessee community a way to come together and serve others in a tangible way. For hundreds of students at the New Dawn Educational Center in Kenya, it has been the start of their journey out of poverty through accessible education. In 2017, New Dawn’s founder decided to host Ellie's Run IN Africa. On August 26th, 2017 in the Karura Forest Park in Nairobi, Kenya, the inaugural and now re-named "Run for Hope" took place, modeled after Ellie’s Run for Africa as a way to raise support locally for the school. It's about 8,100 miles from Nashville to the race site, but the Ellie’s Run team supported them from afar. These students are owning their education and sharing the pride they carry being a part of the New Dawn community. By raising local awareness, they are able to gain more potential local funding and sponsors, as well as find other students eligible to attend, taking one more step toward self-sufficiency as a school community. And now we want to take it a step further and invite YOU to come run with us IN Africa. The 2018 Run For Hope race will be on August 11th in Nairobi, Kenya. Interested in traveling to Africa? Are you interested in running the 5k?